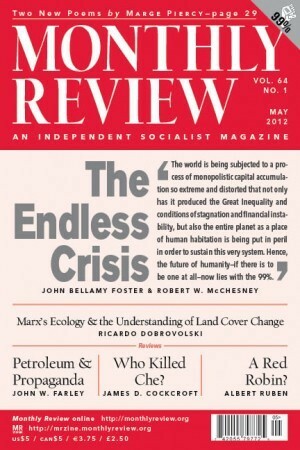 University of Nevada, Las Vegas physicist John W. Farley’s very important review essay on James Lawrence Powell’s new book, The Inquisition of Climate Science, in this month’s issue of MR raises critical questions with respect to science, corporate propaganda, and the future of humanity. Much of Farley’s argument in his review, like Powell’s in his book, focuses on scientific credentials, rather than the actual science of climate change. This may strike MR readers as odd. Why this stress on scientific credentials or the lack of them as opposed to the science itself? Here it is important to understand that this is exactly where the current corporate engendered “climate war” has left us. An excellent guide to what has been happening in this respect (in addition to Powell’s book and Farley’s excellent analysis of it) is an exposé by James Hoggan, The Climate Cover-Up: The Crusade to Deny Global Warming (Vancouver: Greystone Books, 2009). Hoggan is president of the Canadian PR firm Hoggan and Associates and hence well-placed to uncover what appears “to a trained eye” as the “unsavory public relations tactics and techniques and the strategic media manipulation” aimed at climate science under the cover of what purports to be a scientific dispute. To understand the serious propaganda challenge that has confronted capitalist interests intent on denying climate change and the devious means used to get around this, one needs to recognize that the scientific consensus on climate change is an extremely strong one. Science, which generally encourages controversy, is in this case speaking with one voice. Naomi Oreskes, a professor of history and science studies at the University of California, San Diego (and recently co-author with Erik Conway of the new book Merchants of Doubt on how the tobacco lobby for years sought to cloud public perceptions of the scientific evidence against smoking) published an article in Science in 2005 studying global climate change articles in peer-reviewed scientific journals between 1993 and 2003. She found a total of 928 peer-reviewed scientific articles on global climate change. Of these 928 pointed to human-caused climate change, while on the “other side” there were exactly zero denying this. Although attempts were made by climate deniers to criticize Oreskes’s findings, no one could locate a single peer-reviewed science article taking issue with the global scientific consensus on human-generated climate change in order to disprove her results, since such an article did not exist. Yet, a 2004 study by the brothers Jules and Max Boykoff in the journal Global Environmental Change (vol 14, no. 2:125-136), entitled “Balance as Bias: Global Warming and the U.S. Prestige Press,” demonstrated that in the four leading newspapers studied (New York Times, Wall Street Journal, Washington Post, and Los Angeles Times) a majority of the articles (53 percent) between 1988 and 2002 presented a scientist on one side, and a corporate-friendly spokesperson (usually not a scientist, and invariably someone removed from climate science research) on the other. Neither the media’s proclivity for emphasizing views comfortable to the capitalist power elite, nor the added leg up commonly given to the establishment in the name of “balance” (where needed to counter views inconvenient to the status quo) could quite account for the gross disparity between scientific results and the science news reporting of the prestige press. In fact, as Hoggan (and Powell and Farley) show, this was the product of a powerful corporate-funded public relations effort aimed at undermining the scientific consensus from outside under the pretense of a “scientific debate” over global warming. As a propaganda campaign designed to hoodwink the public—sufficient to prevent any concerted public action—this corporate-funded effort turned out to be remarkably successful. A national poll conducted by Yale and George Mason University in June 2010 found that a little over a third of those polled (34 percent) agreed with the statement that “most scientists think global warming is happening,” while nearly half (49 percent) believed either that “most scientists think global warming is not happening” (4 percent) or that “there is a lot of disagreement among scientists about whether global warming is happening” (45 percent). A Pew Research Center poll in 2008 discovered that only 19 percent of college-educated Republicans believed in the existence of human-generated global climate change. Between 2008 and 2010, according to the Yale/George Mason survey, entitled “Climate Change in the American Mind,” the percentage of the U.S. population that believed that climate change was occurring at all—despite a strong scientific consensus that the problem was accelerating—had dropped like a stone from 71 percent in November 2008 to 57 percent in January 2010 (in May 2011 it rose again to 64 percent). Climate change implies the biggest political ‘I told you so’ since Keynes predicted German backlash from the Treaty of Versailles. 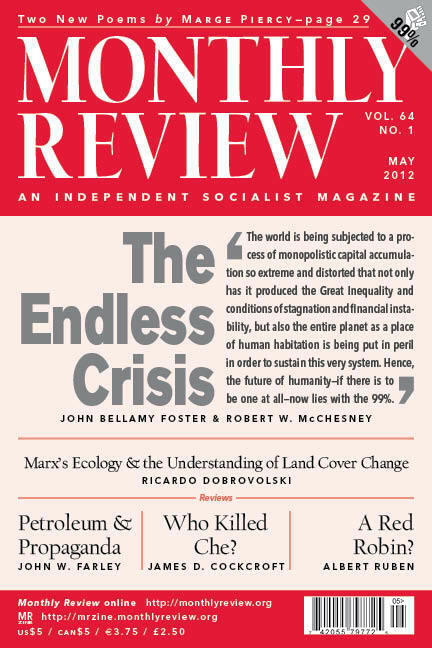 Marx wrote about capitalism’s “irreparable rift” with “the natural laws of life itself,” and many on the left have argued that an economic system built on unleashing the voracious appetites of capital would overwhelm the natural systems on which life depends. And of course indigenous peoples were issuing warnings about the dangers of disrespecting “Mother Earth” long before that. The fact that the airborne waste of industrial capitalism is causing the planet to warm, with potentially cataclysmic results means that, well, the naysayers were right. And the people who said, “Hey, let’s get rid of all the rules and watch the magic happen” were disastrously, catastrophically wrong.